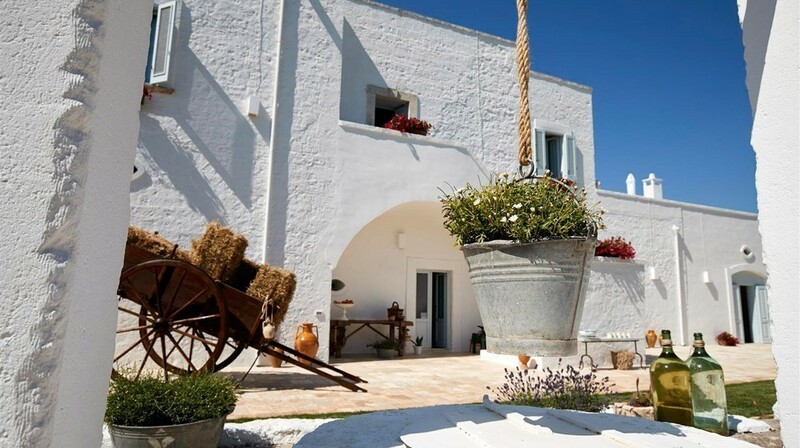 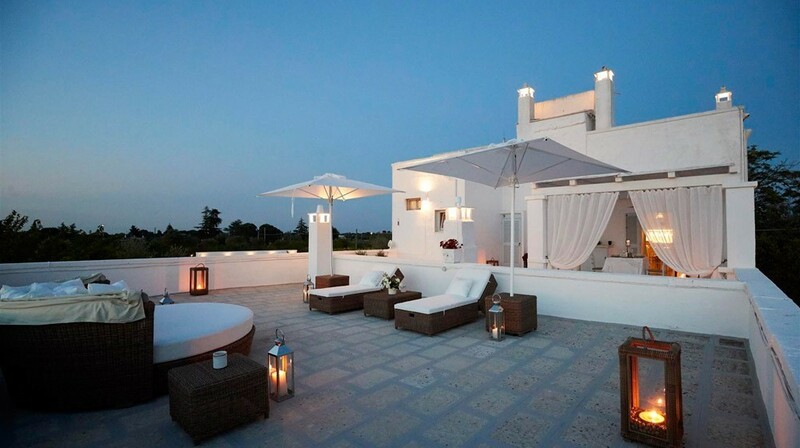 A splendid property set in the countryside of Polignano a Mare, Masseria Valle dei Ciliegi comprises three separate apartments, which can also be rented as single units, and 2 dependances. 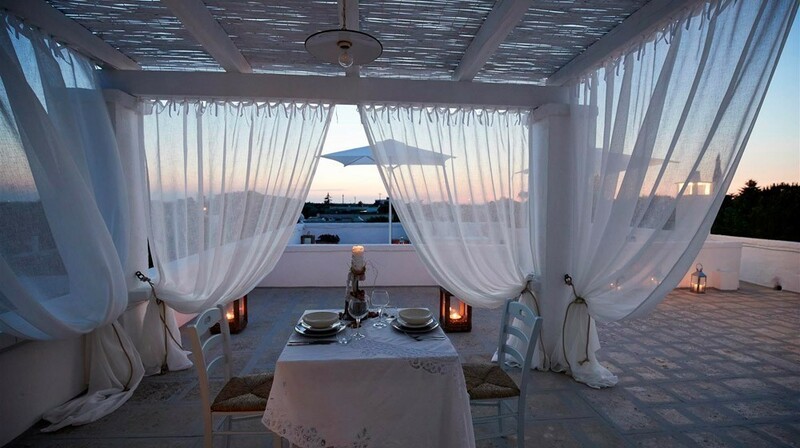 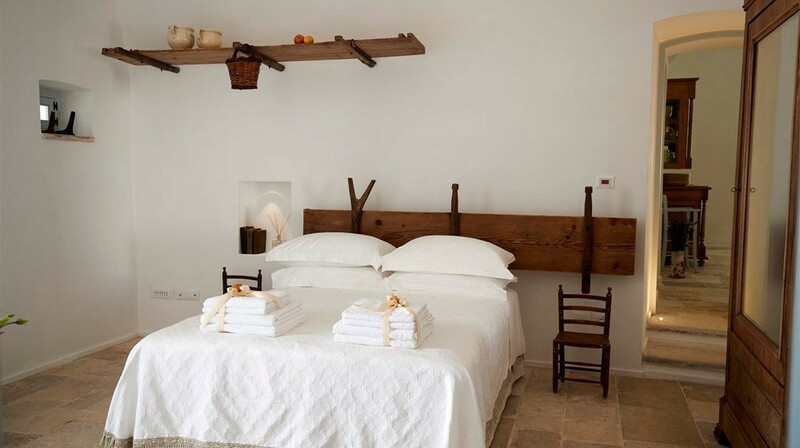 Large and luminous, the bedrooms are on the first floor and face on to a terrace, with a pergola, a charming, panoramic haven where guests can enjoy a secluded breakfast, dine or quite simply relax from dawn to sunset. 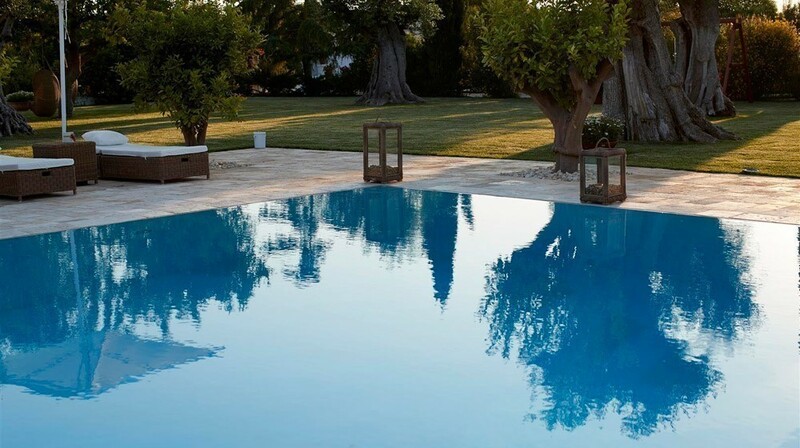 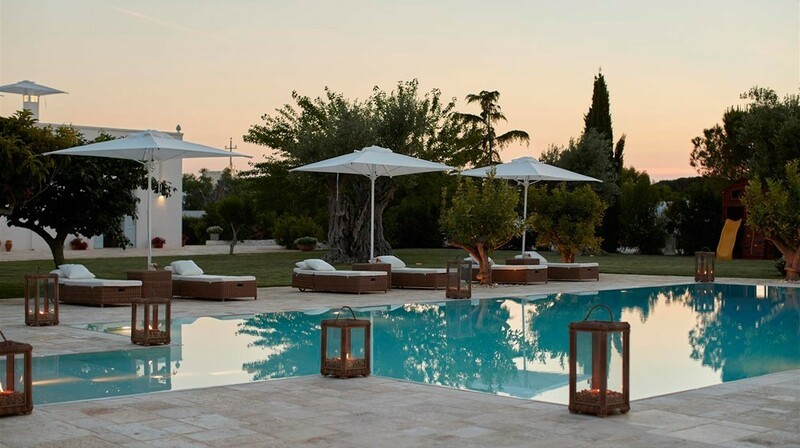 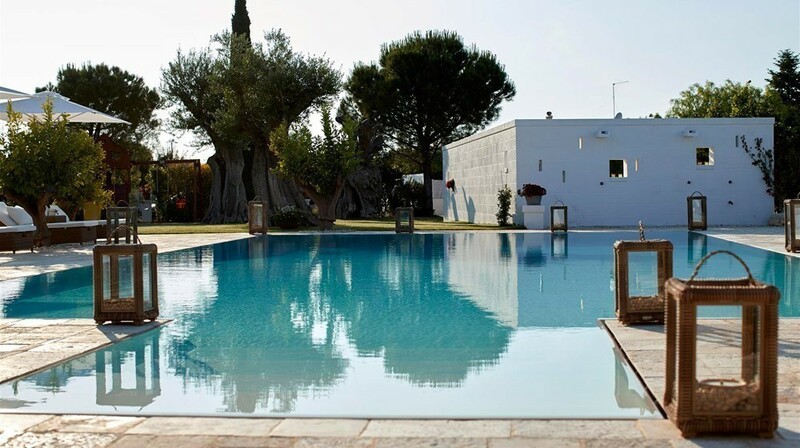 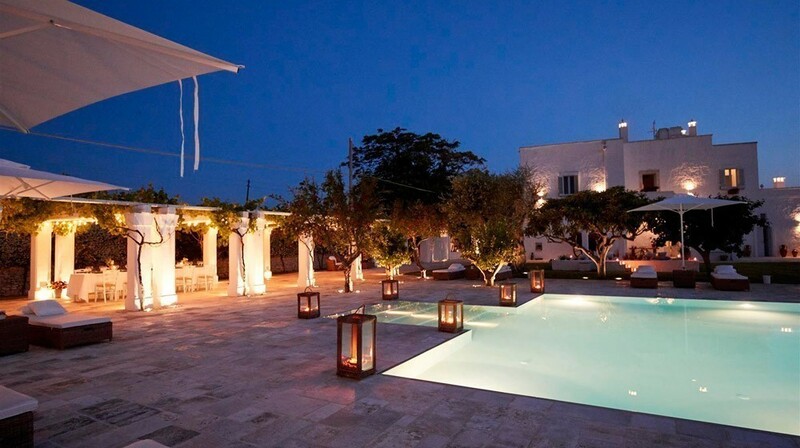 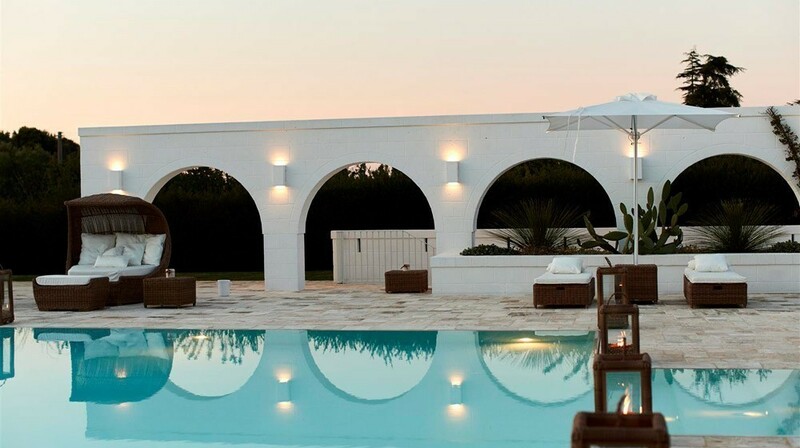 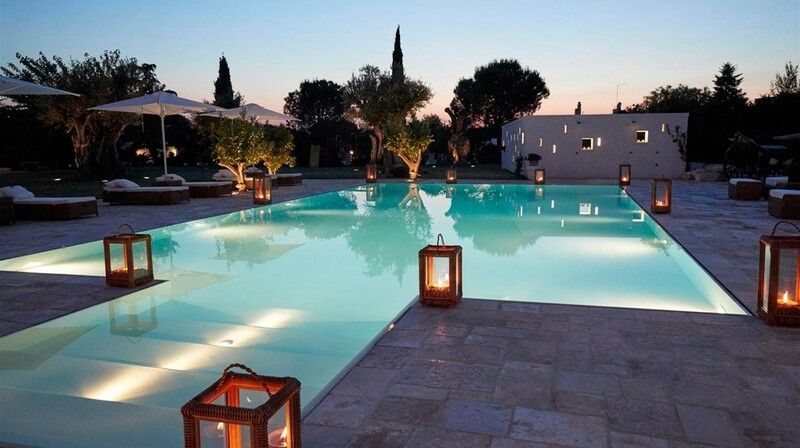 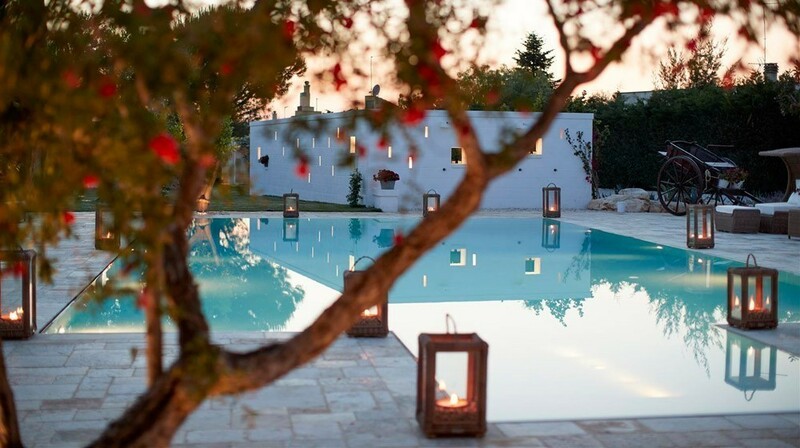 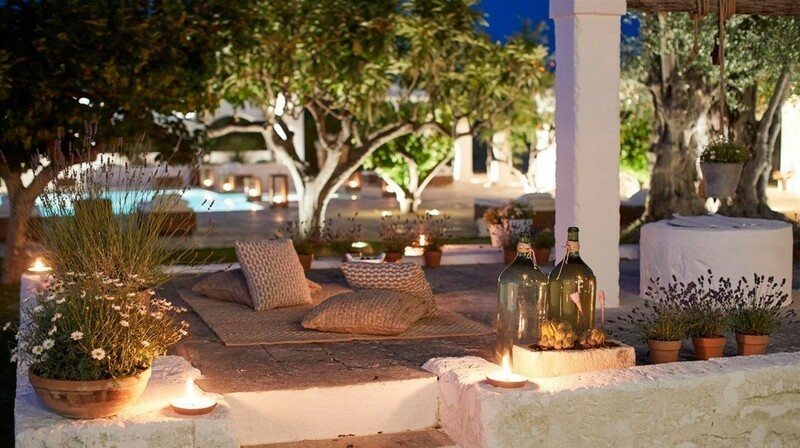 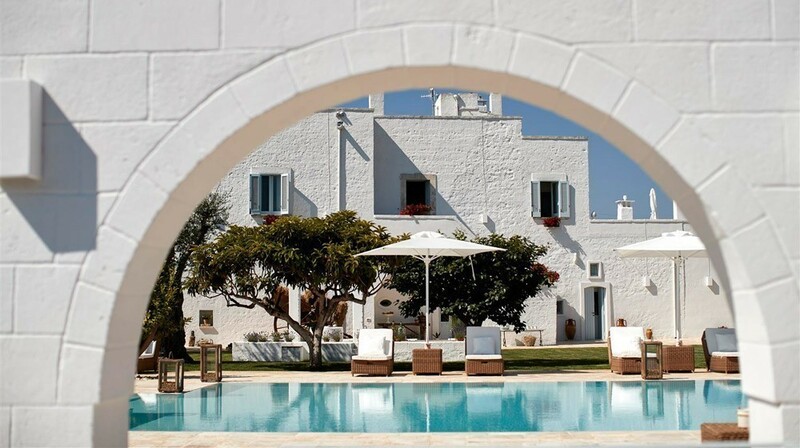 A large garden surrounds the masseria and hosts a fine infinity pool with solarium, equipped with sun loungers and umbrellas. 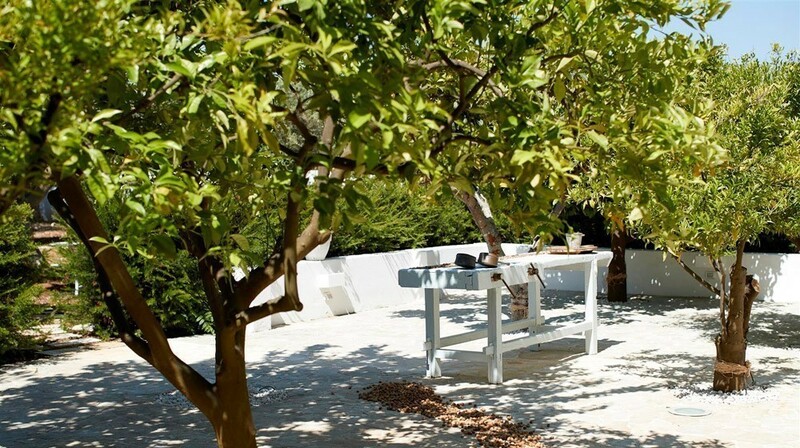 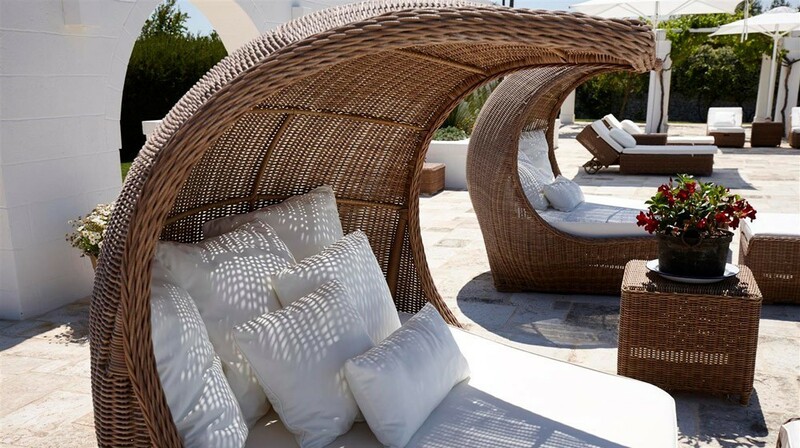 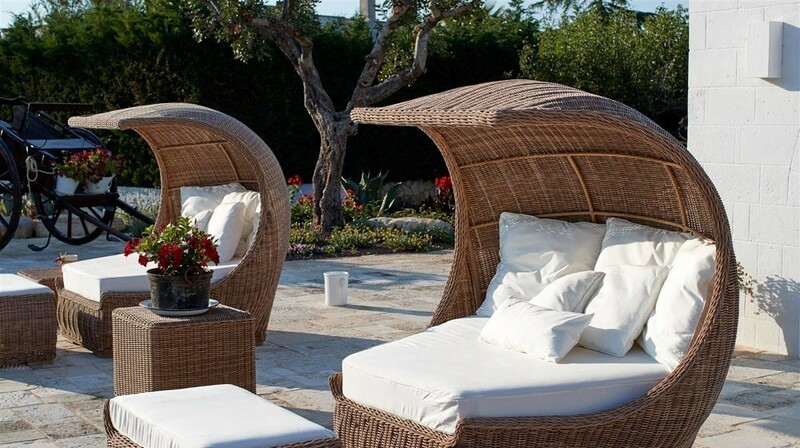 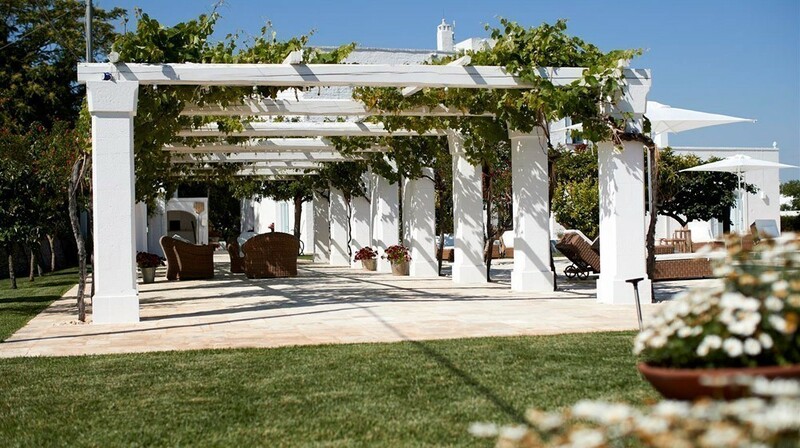 Amidst green lawns and fine olive trees there are several areas for relaxation set up with sun loungers, hammocks and tables ideal for dining ‘al fresco’. 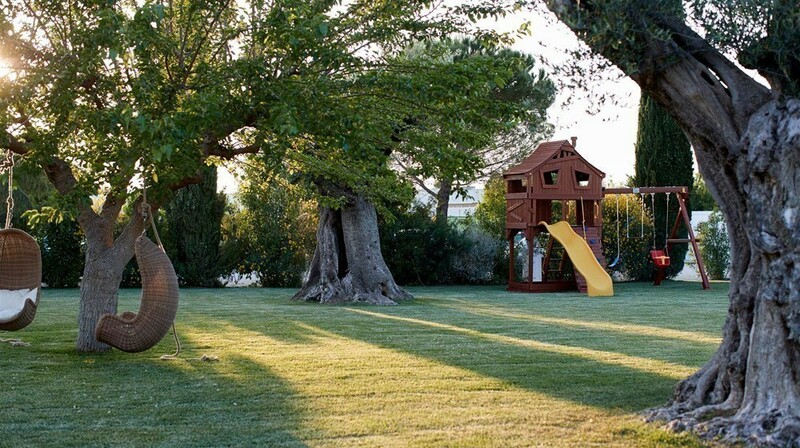 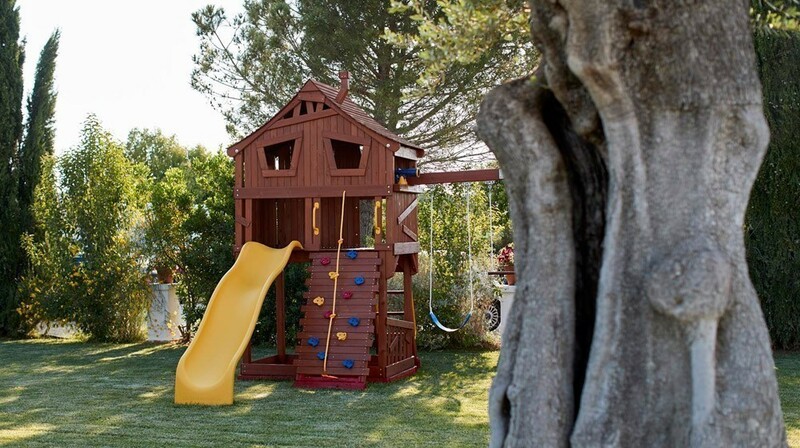 The garden also has some zones set up with playground equipment, available for smaller guests. 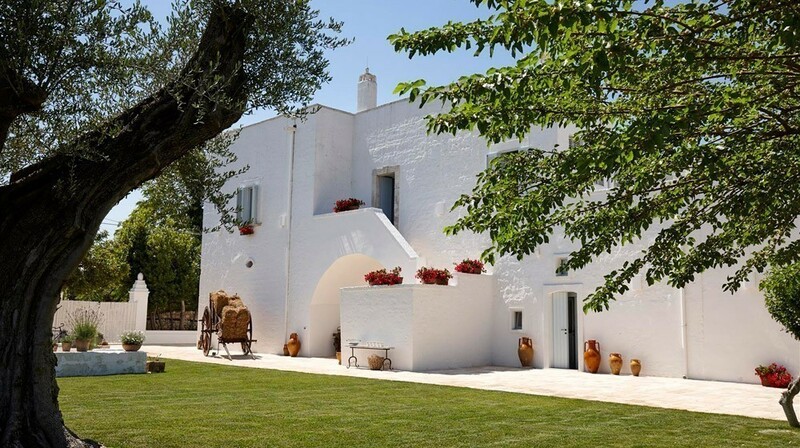 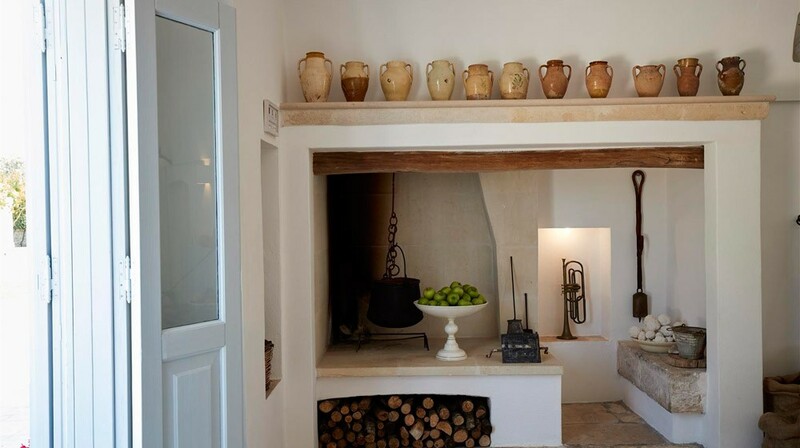 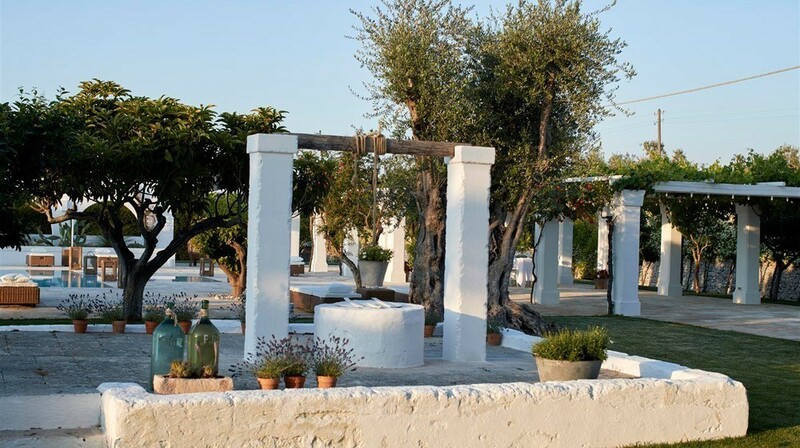 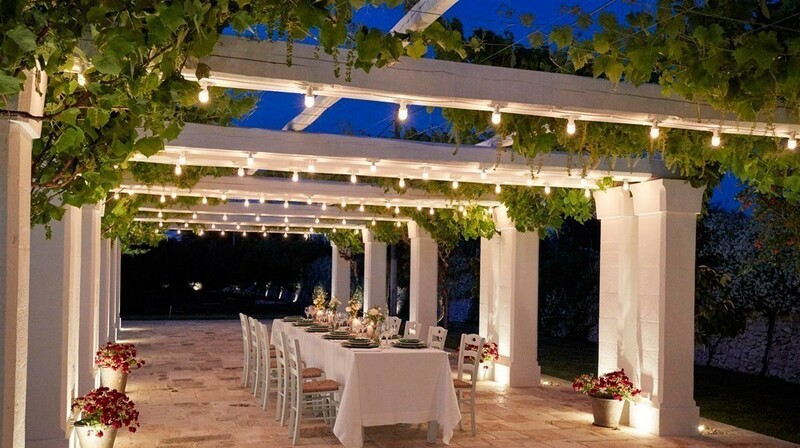 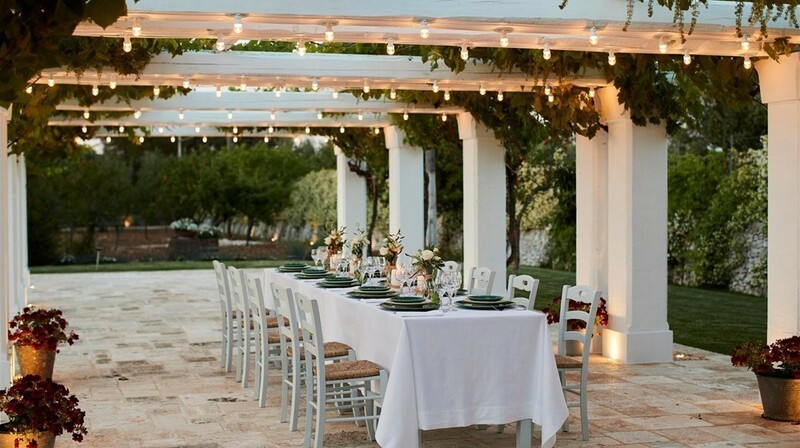 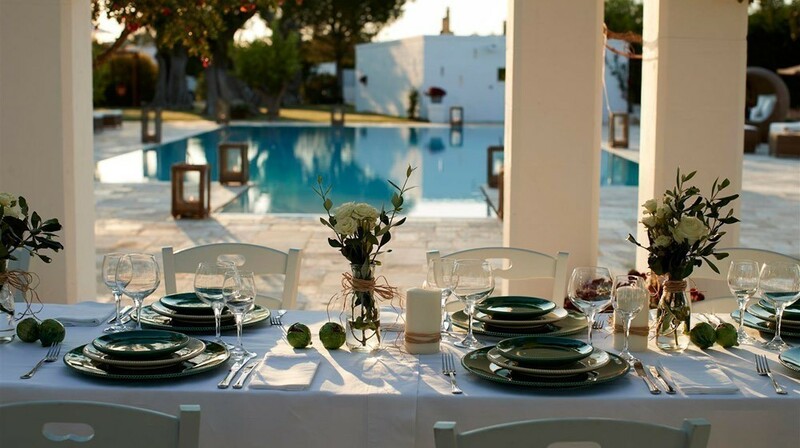 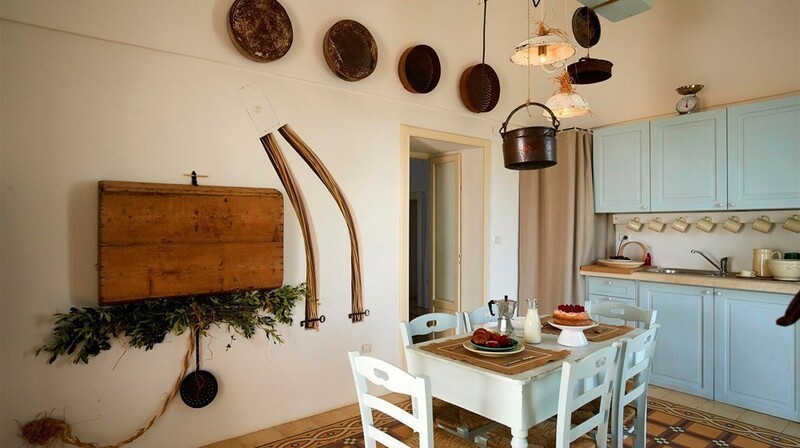 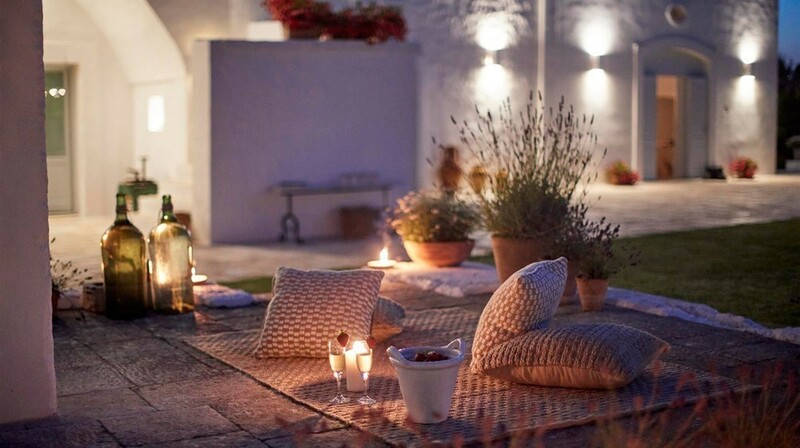 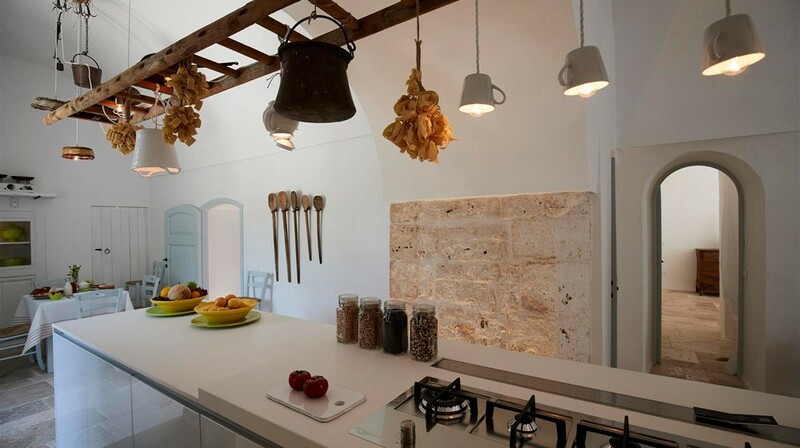 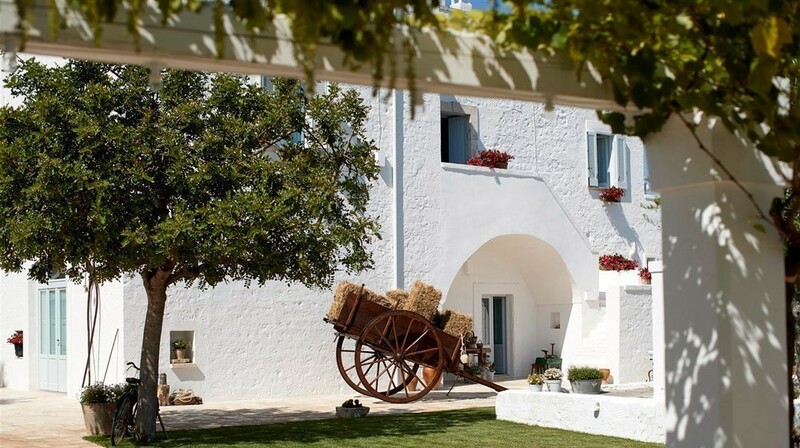 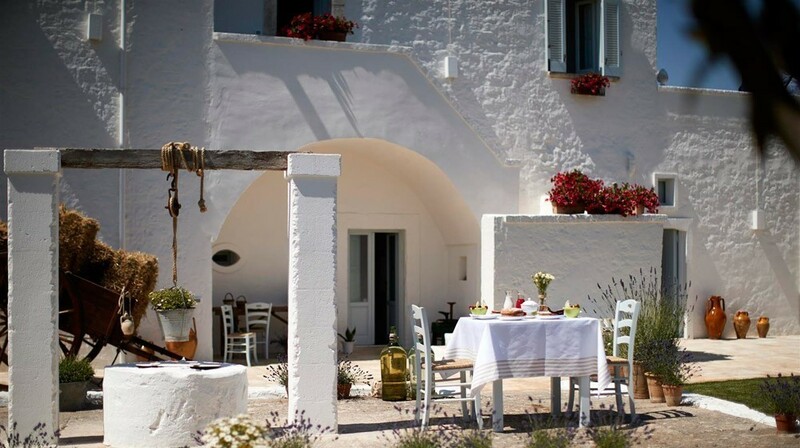 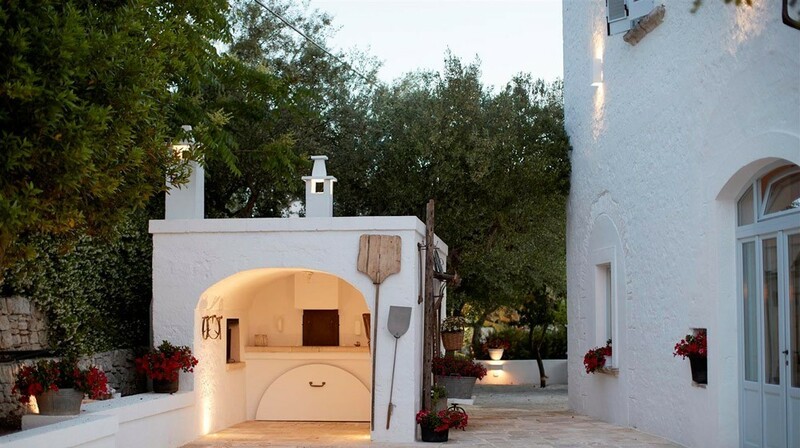 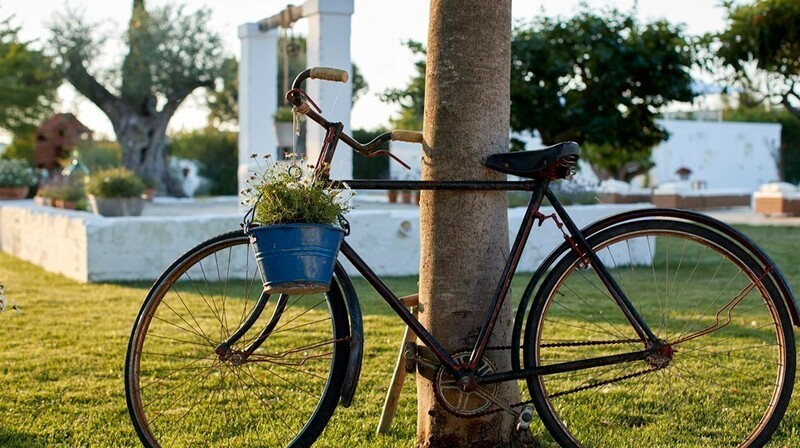 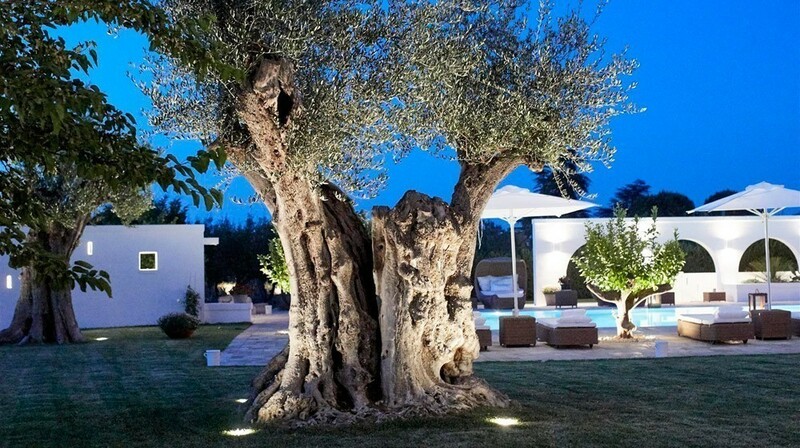 Guests can enjoy the cuisine of Puglia by cooking fresh vegetables from the kitchen garden and delicious local produce to be prepared in the wood-fired oven, just a short distance from the pool. 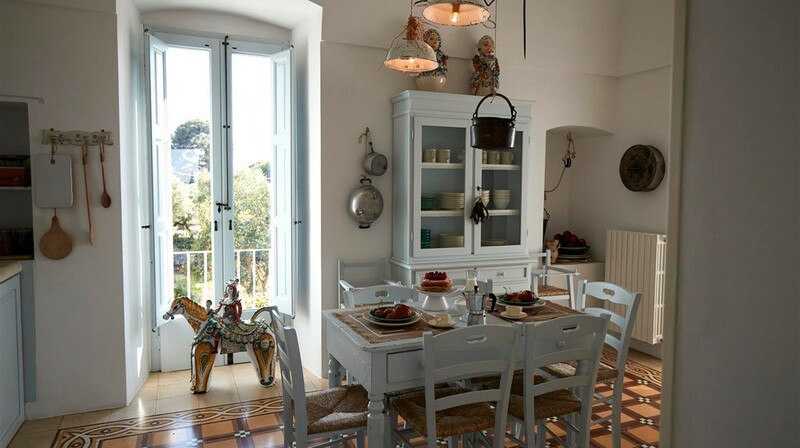 A fine apartment set on the second floor, La Terrazza has its own private terrace and pergola furnished with table and chairs. 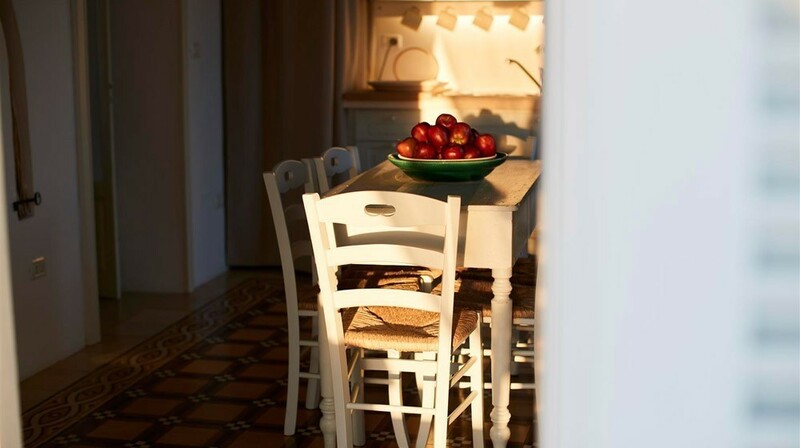 The apartment has a stylish lounge area furnished in Victorian style and a practical, well-equipped kitchen. 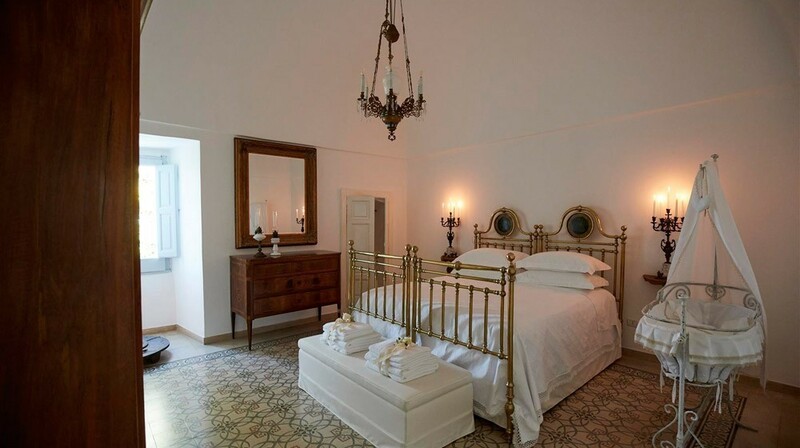 The two double bedrooms have a four-poster bed and a king-size bed framed in wrought iron. 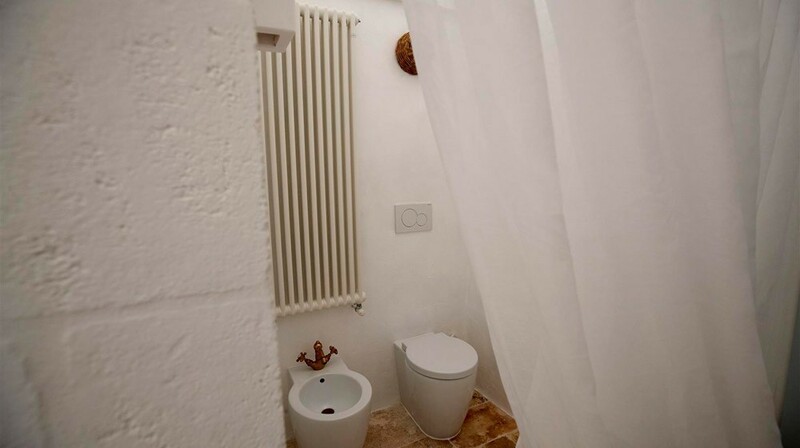 They share the only bathroom of the apartment. 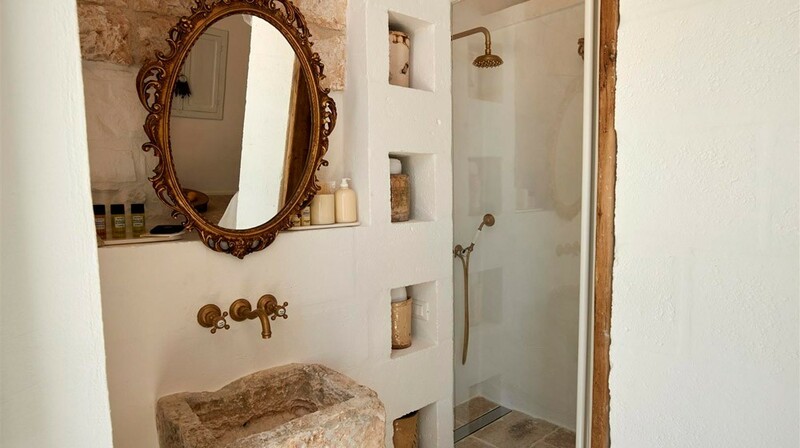 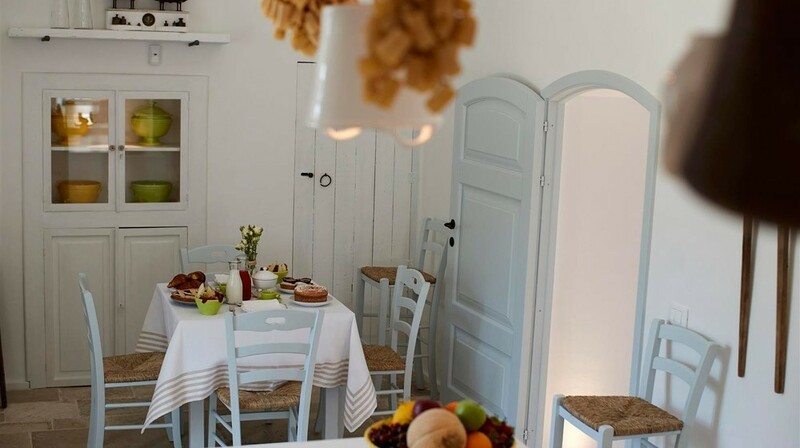 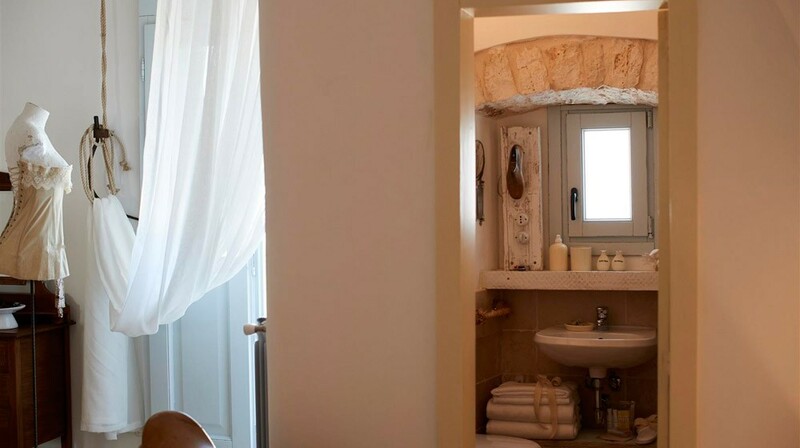 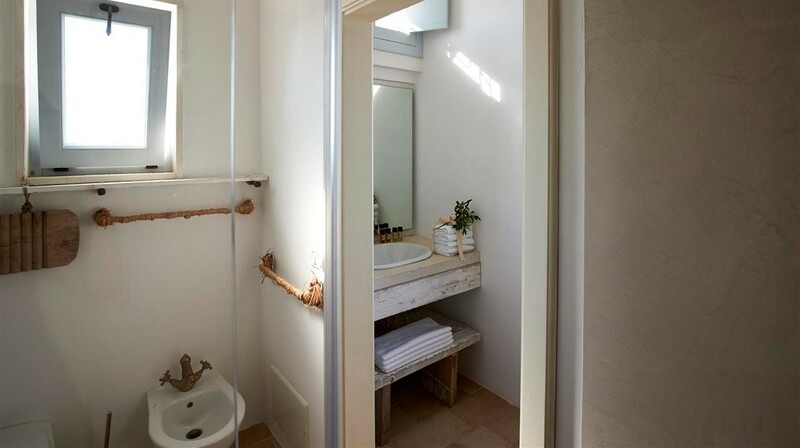 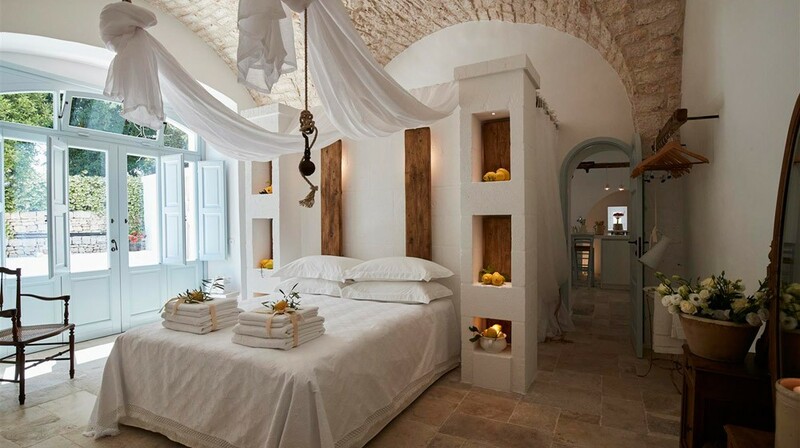 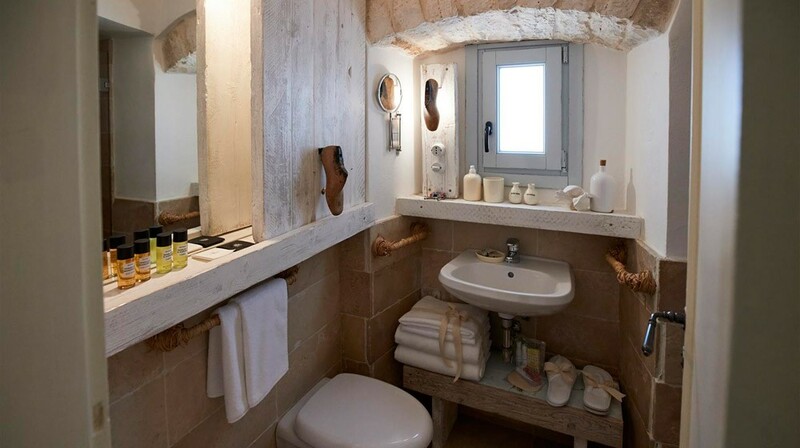 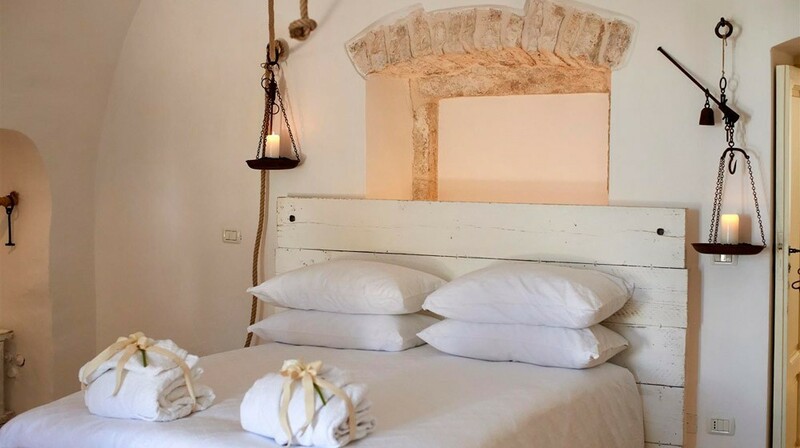 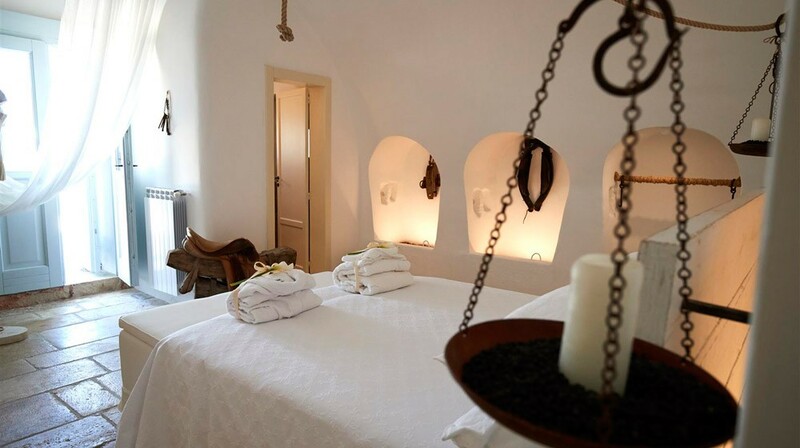 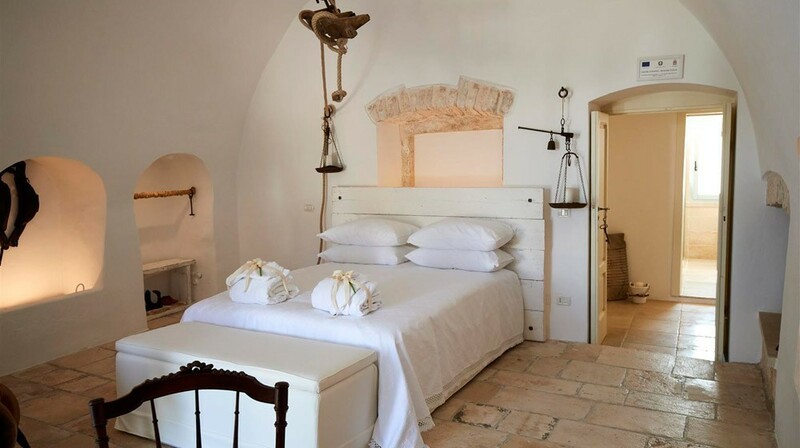 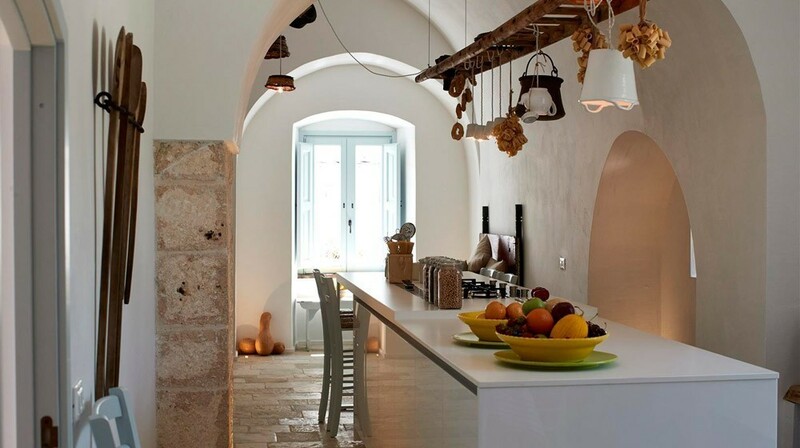 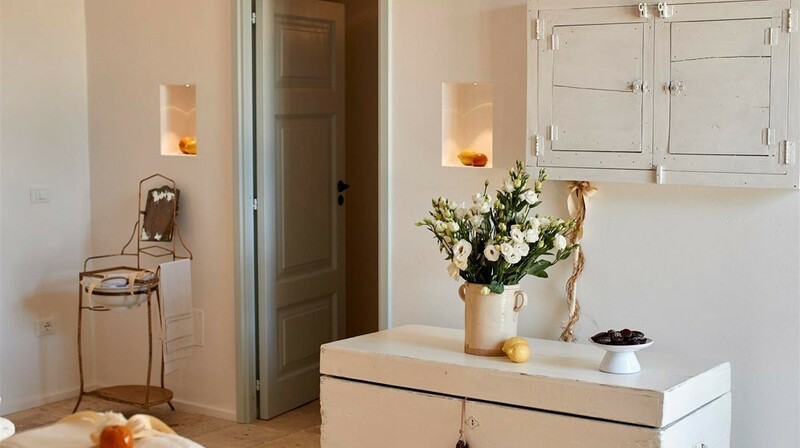 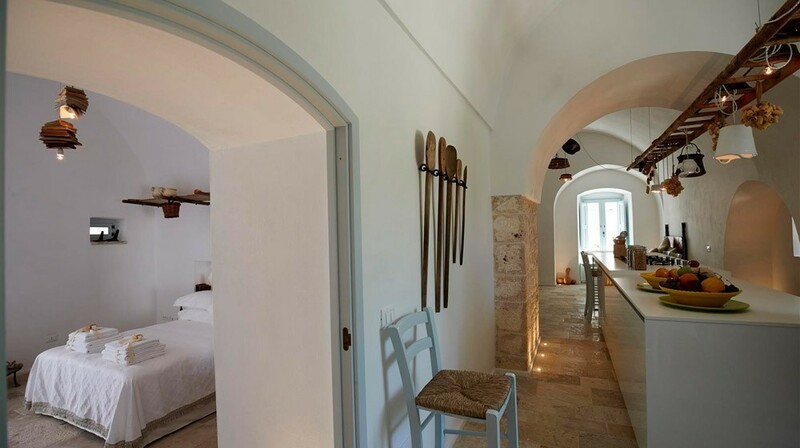 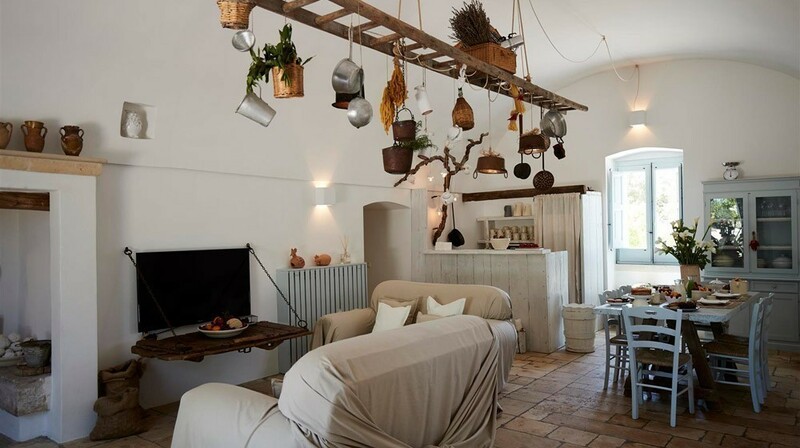 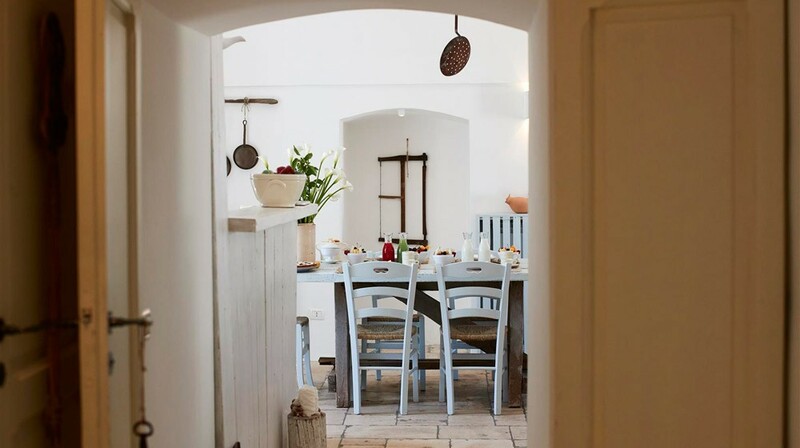 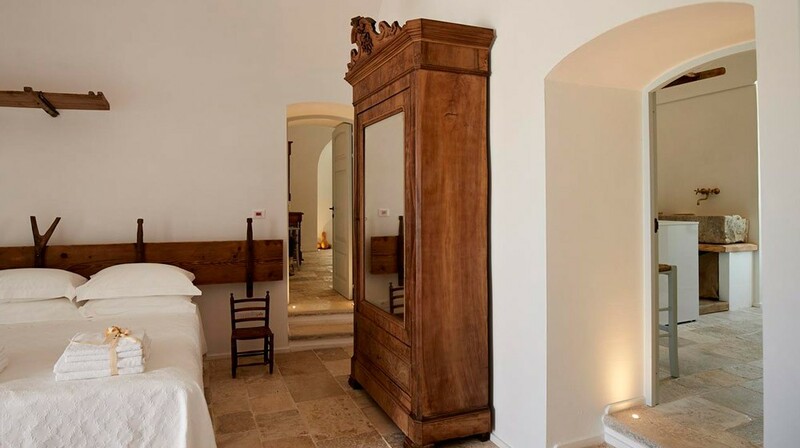 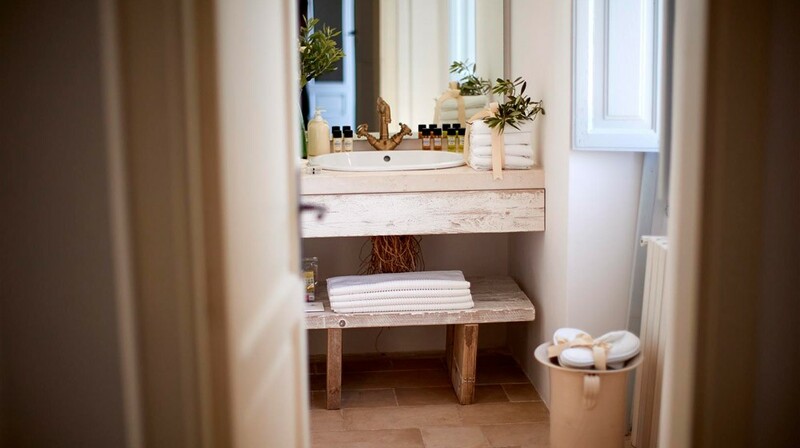 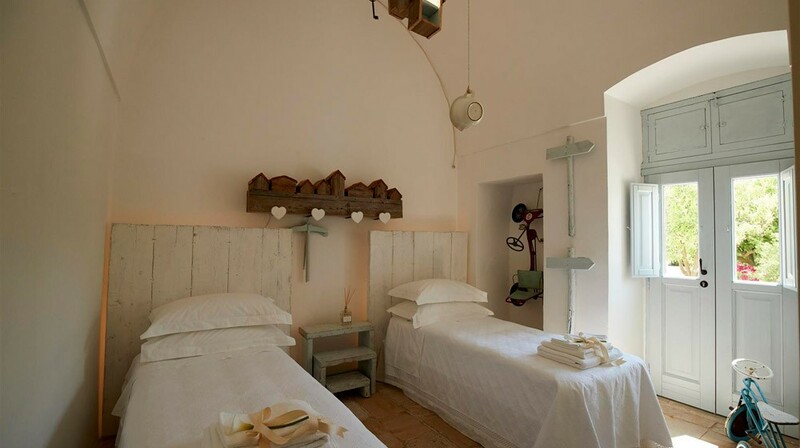 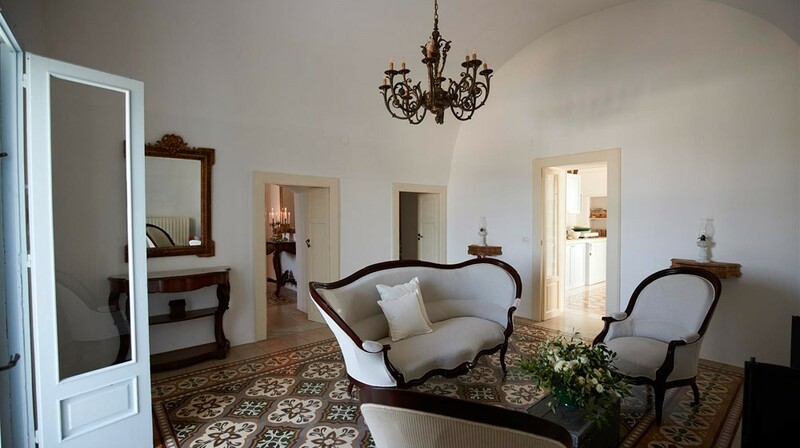 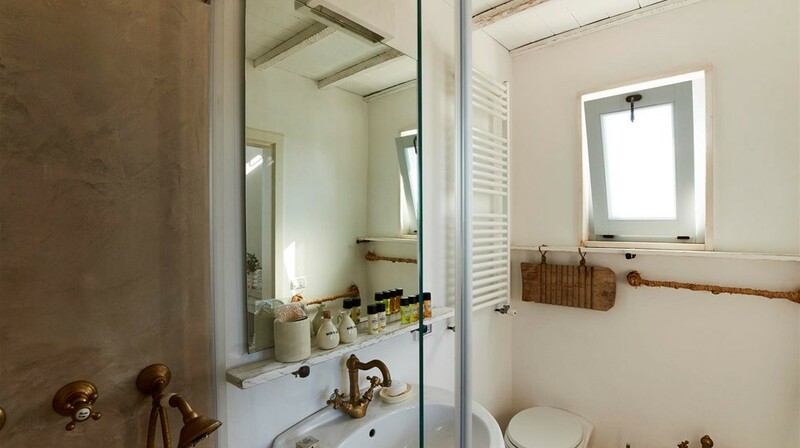 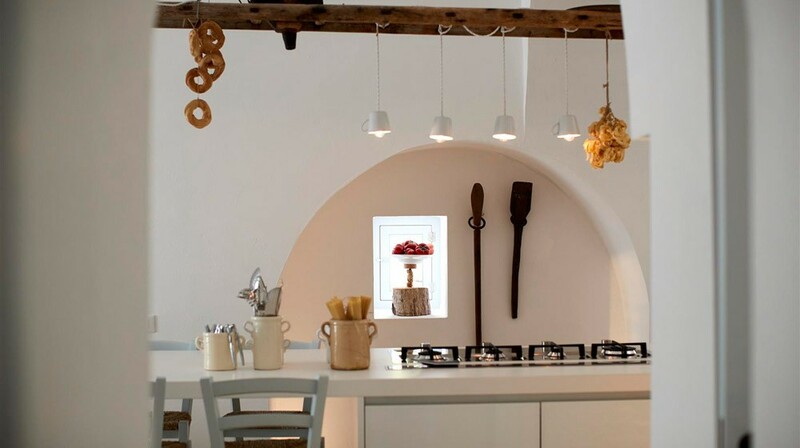 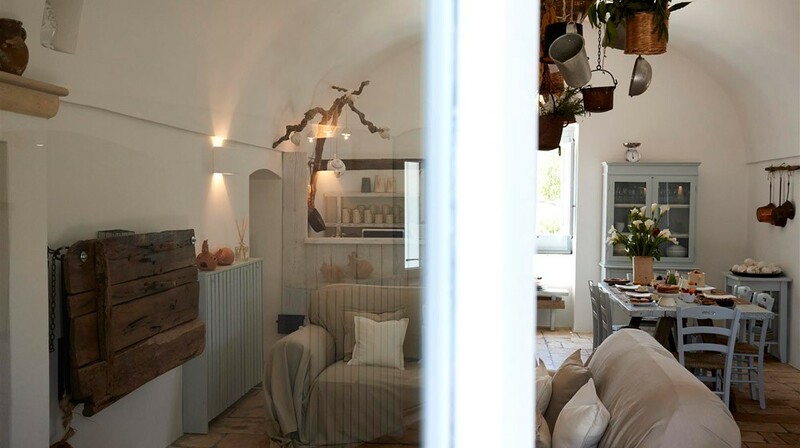 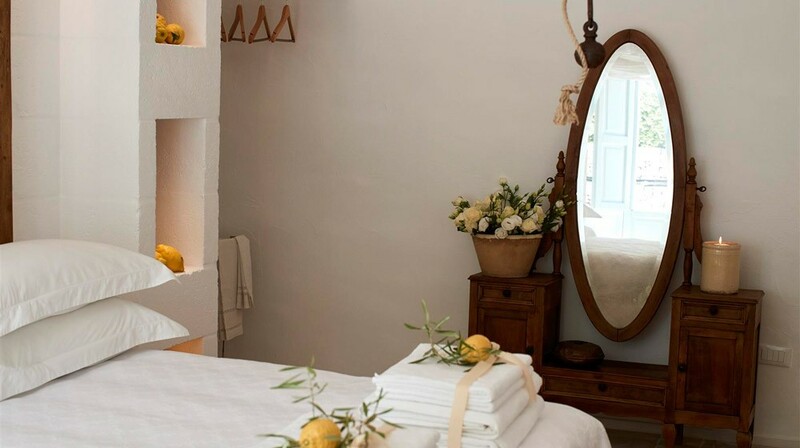 An appealing blend of ancient and modern is offered by the Agrumi apartment, which has preserved old wooden furnishings, the original tiled floor and the whitewashed walls of traditional Puglia. 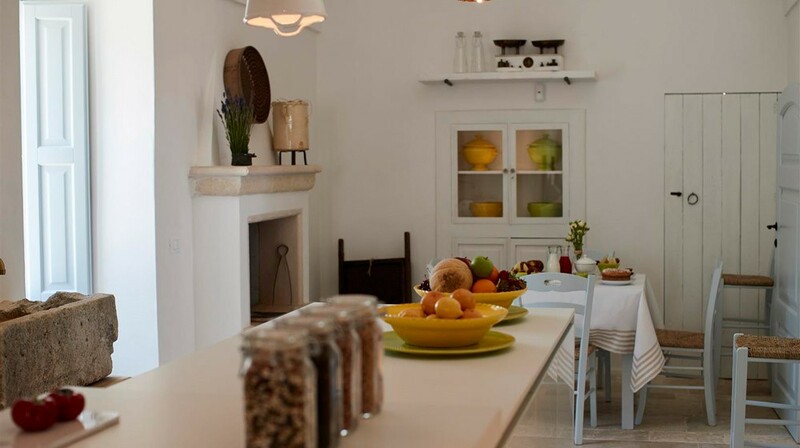 The apartment consists of two double bedrooms, two bathrooms, a kitchen and a dining room. 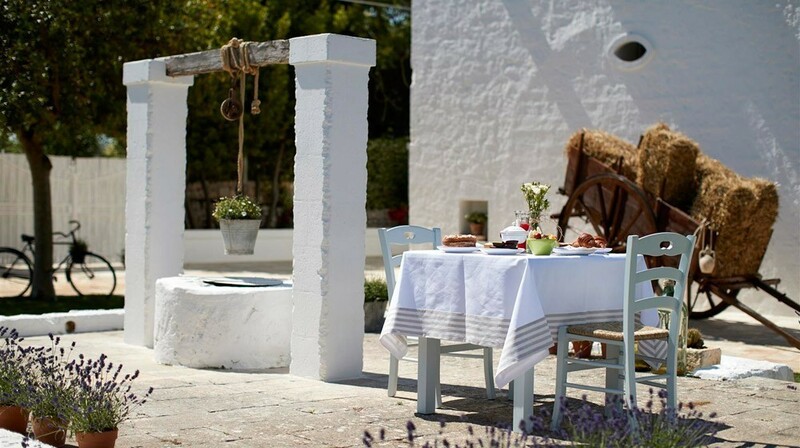 Passing through the patio guests will find a charming external area, equipped with table and chairs. 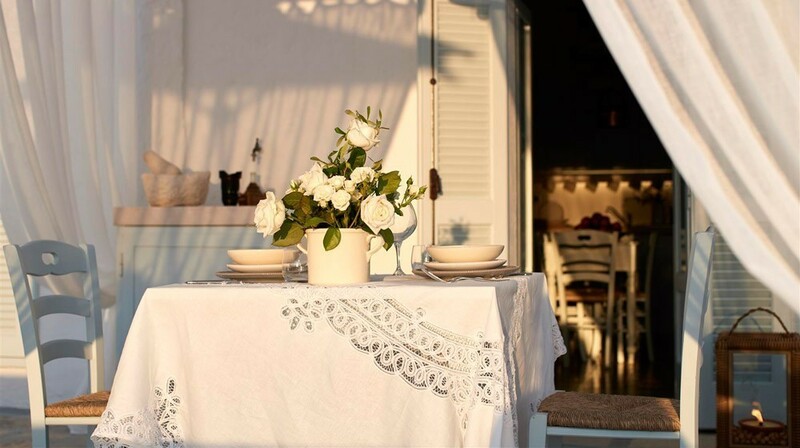 A welcoming unit able to host four guests, Gelso has one double bedroom plus a room with two single beds, looking out over the garden and pool with a fine exclusive-use patio. 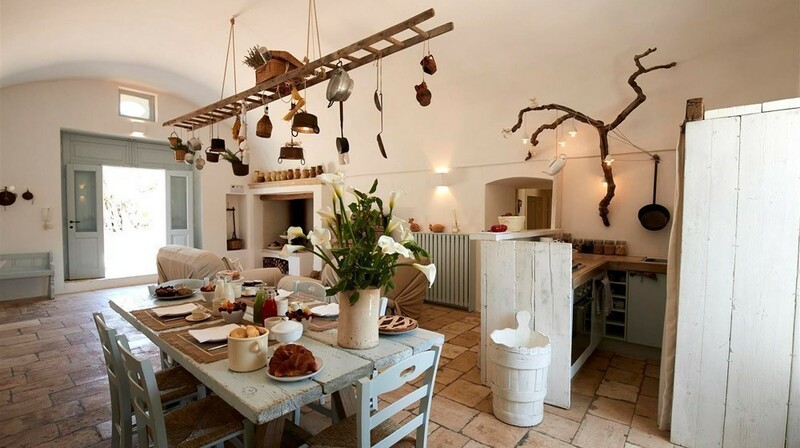 It also has a fine open-plan living area and a fully equipped kitchen. 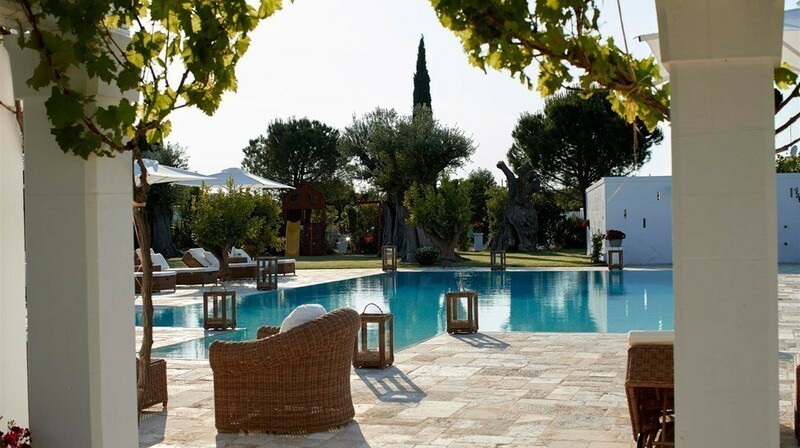 With its contemporary yet evocative traditional decorations, the Dépendance Lavanda is surrounded by a thriving garden with a shady patio and a hydromassage pool. 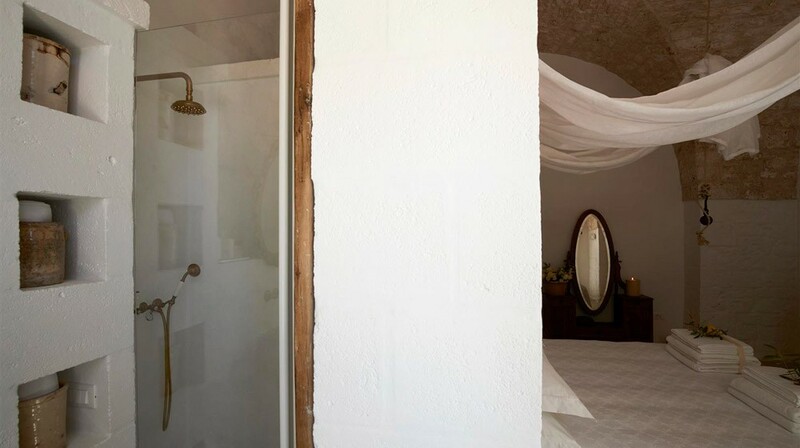 It has a comfortable double bedroom, a spacious living area with a sofa, kitchenette, a stone bathroom with shower cubicle, a private patio with pool view, Wi-Fi, LCD TV, satellite channels (including Sky Sport), telephone and safe. 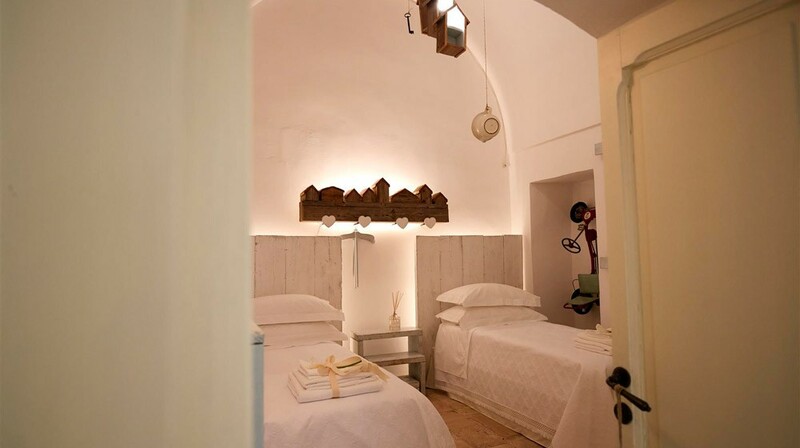 The Dépendance Lavanda can accommodate up to 2 guests (and 1 infant). 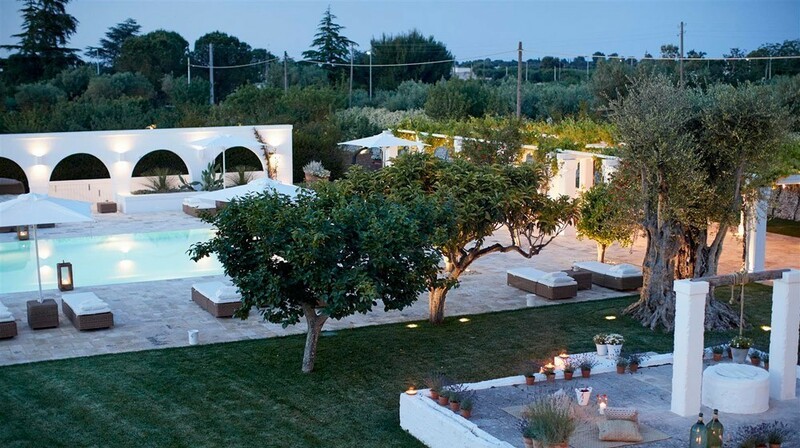 With its contemporary yet evocative traditional decorations, the Dépendance Mandorla is surrounded by a thriving garden with a shady patio and a hydromassage pool. 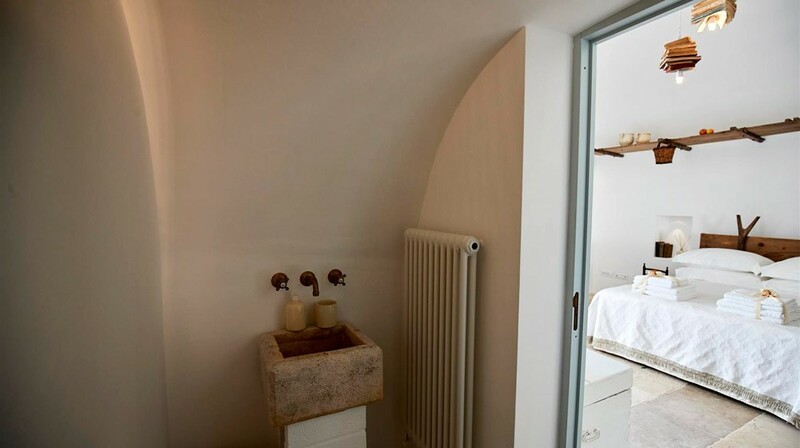 It has a comfortable double bedroom, a spacious living area with a sofa, kitchenette, two stone bathrooms with shower cubicle, a private patio with pool view, Wi-Fi, LCD TV, satellite channels (including Sky Sport), telephone and safe. 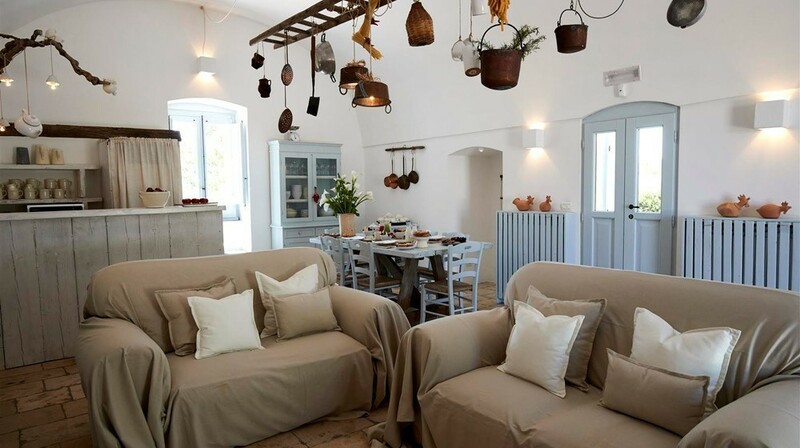 The Dépendance Mandorla can accommodate up to 2 guests (and 1 infant). 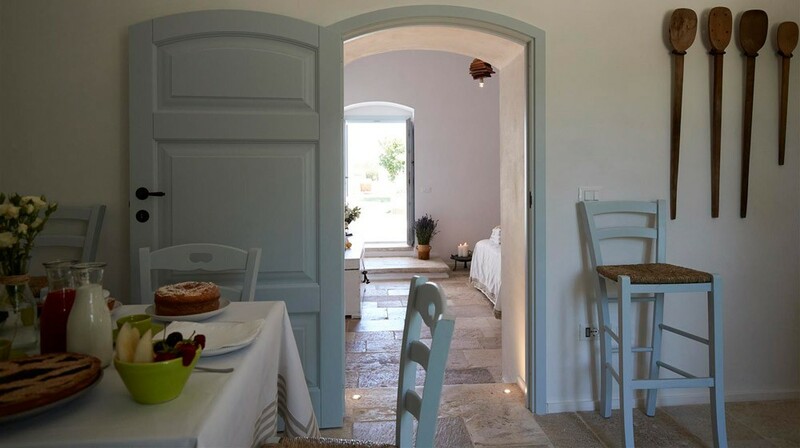 - Wi-Fi connection (Wi-Fi connection is not high quality, but it is sufficient to check your emails and keep in touch with the rest of the world, while you enjoy the peace and quiet of your villa). 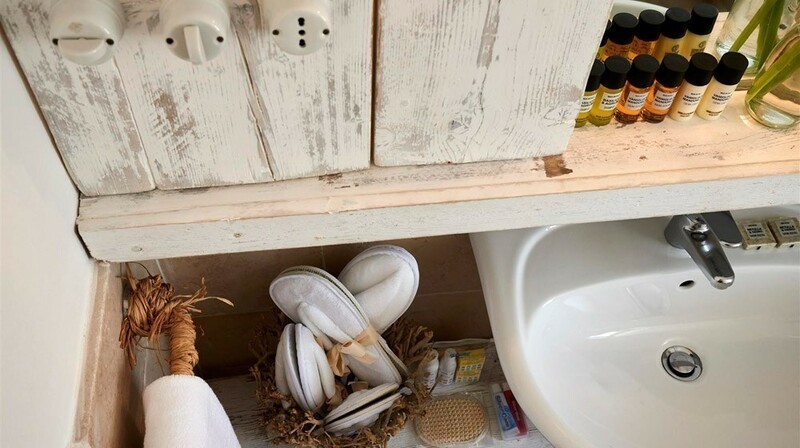 - Linen and bath towels (twice a week), bathrobe and sleepers (once a week). 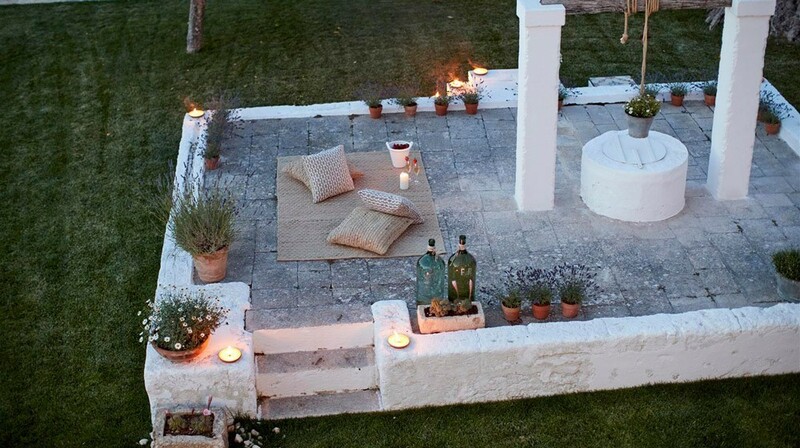 Changeover day in July and August: Saturday. 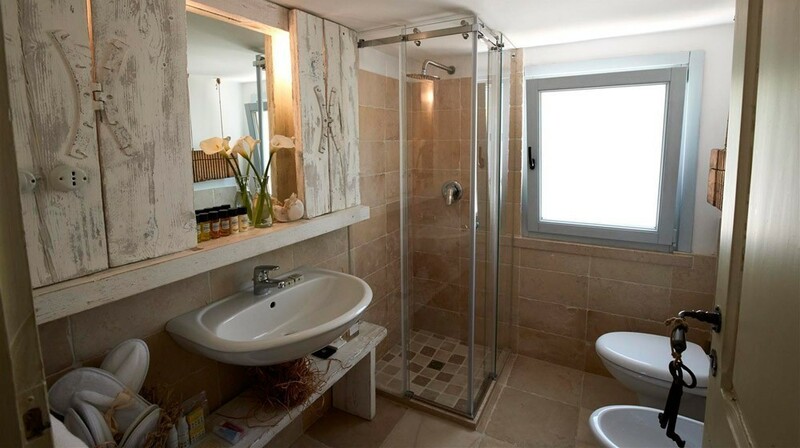 - Cleaning twice a week: on Wednesday and Saturday.